In mindfulness meditation we are trying to achieve a mind that is stable and calm. What we begin to discover is that this calmness or harmony is a natural aspect of the mind. Please join us each Wednesday evening for an introduction to meditation and the Shambhala Centre. Meditation instruction and practice, along with some teachings and discussion, are led by a senior practitioner of the Shambhala community. Come and learn about the variety of programs and opportunities for practice offered here. Everyone is welcome to come and you may leave at any point of the evening. 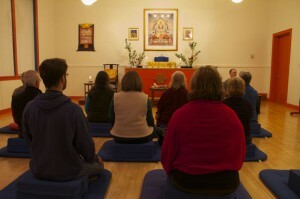 7:00 – 8:00 pm – Introductory meditation instruction, sitting and walking meditation practice. 8:00 – 8:30 pm – Reading, contemplation and discussion. You can view the Shambhala Centre Schedule here. Contact us for more information and find our location here.